FLINT, Michigan — Here, the Rev. Dr. Martin Luther King Jr. is more than a day. More than a holiday. More than a remembrance. 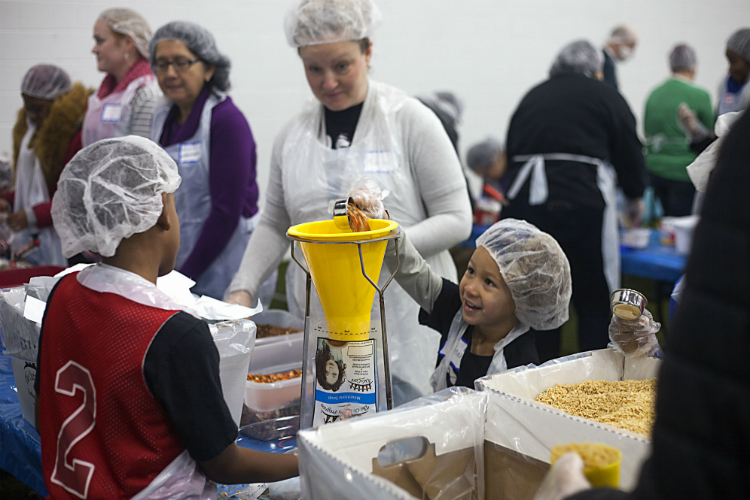 Here, MLK Day is a day of action and service to the community. There are special events throughout the city including the Big Brothers Big Sisters Mentoring Inspiration breakfast, the Youth Tribute at Mt. Olive Missionary Baptist Church, a water giveaway at First Trinity, the annual program at the Flint Public Library, and volunteer efforts throughout the city. 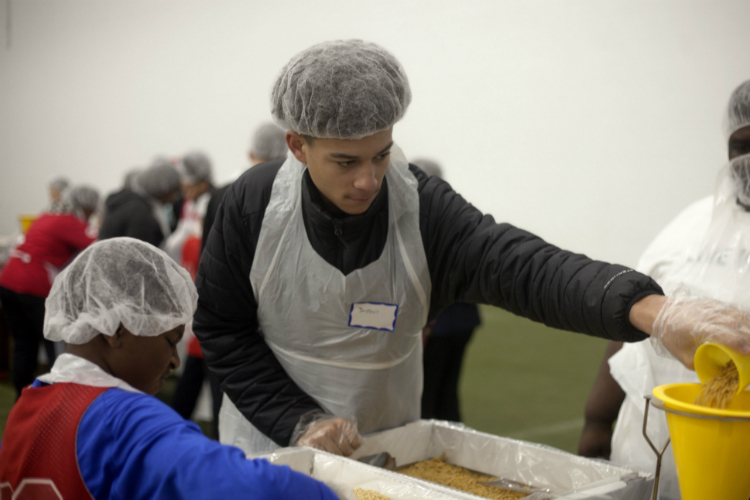 Among all the activity was one special event this year: The single largest volunteer effort on MLK Day we've ever seen. 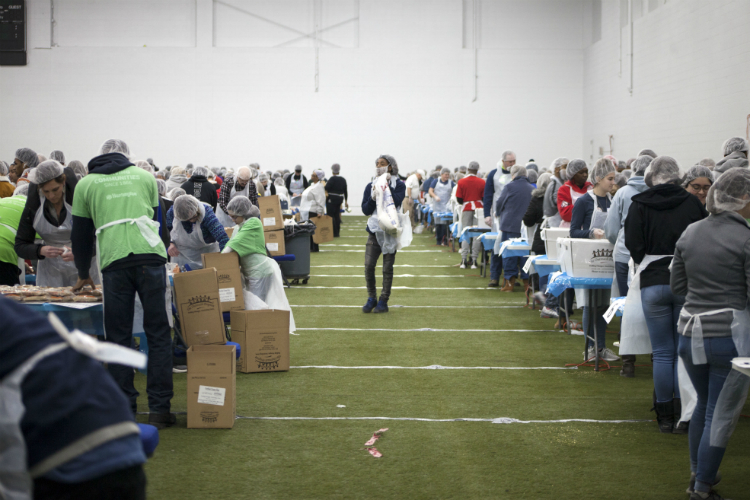 The United Way of Genesee County gathered 550 volunteers at the Dort Federal Event Center to help pack 120,000 meals donated to the Food Bank of Eastern Michigan and local food pantries. 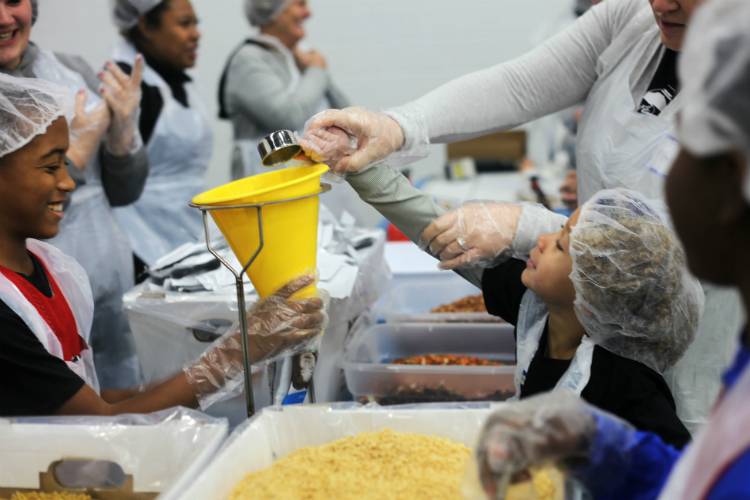 The effort brought together children and families, students and professors, and people from every corner of Flint and Genesee County to work side-by-side. We think Lenwood Hayman put it best: “Love, love, love. Love is the most important thing. Dr. King's primary message was all about love — to make sure you do the work to care for the people you can help,” the professor of Public Health and Health Science at University of Michigan-Flint said. Tables lined the Dort Federal Event Center to accommodate the huge number of volunteers. 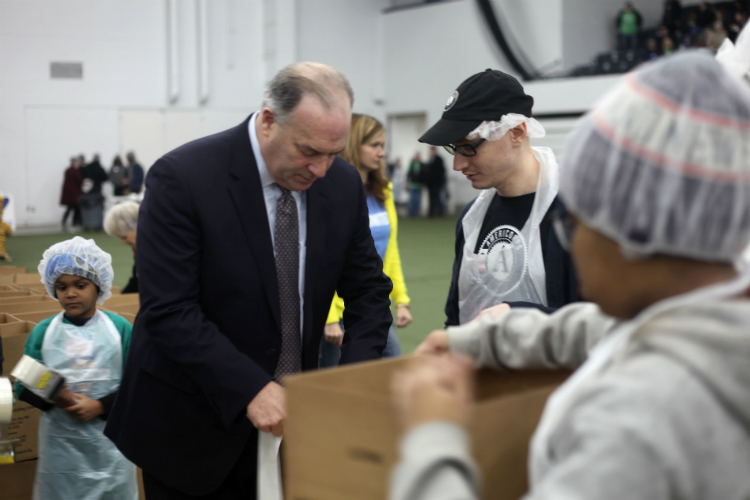 The volunteers also included U.S. Rep. Dan Kildee. 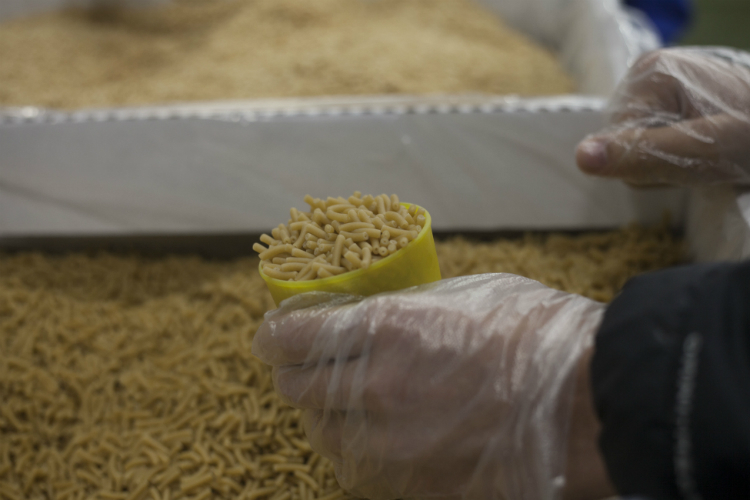 “We need to push for some big structural changes when it comes to dealing with poverty in this country, but we also need to try our best to provide for those who are hurting right now. 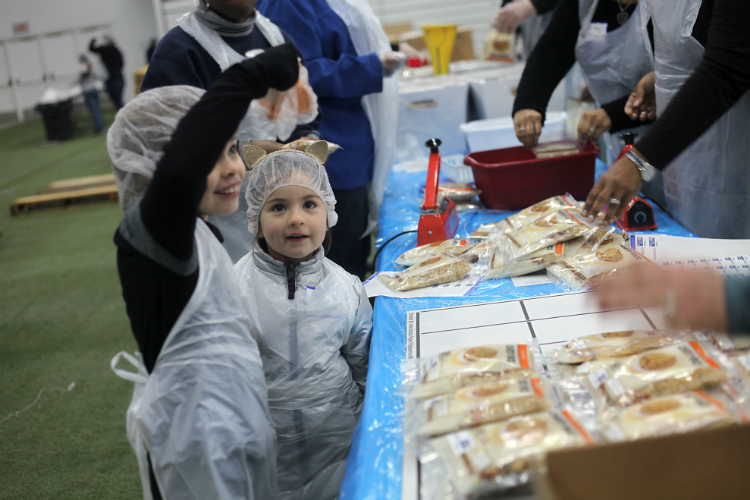 You have to do Desmond Suliamar, 5, looks on at the mob of hair nets wearing volunteers as 550 volunteers descended on the Dort Federal Event Center in Flint to fill boxes of food for the hungry. 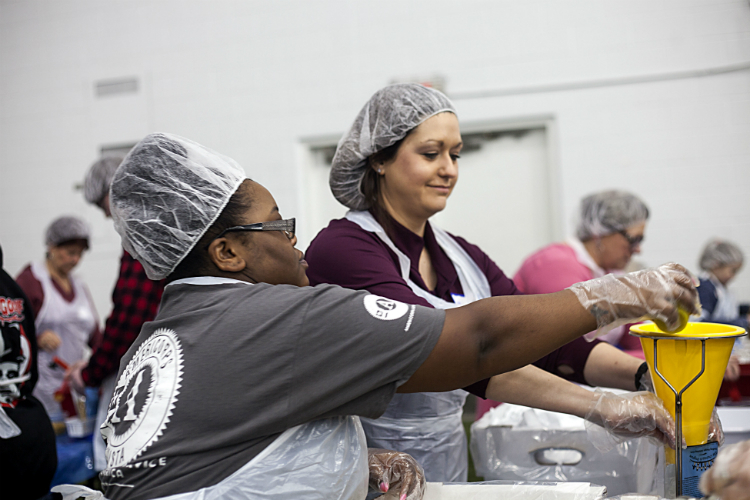 Volunteers helped pack 120,000 meals at the day of service organized by the United Way of Genesee County. 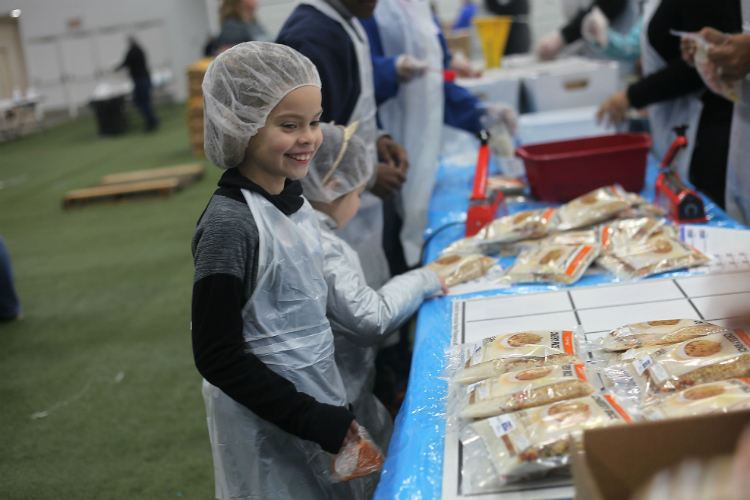 Aaron Lawler, 11, helps Laylah Johnson, 5, pour rice into a funnel at the Martin Luther King holiday food drive at the Dort Federal Event center in Flint. 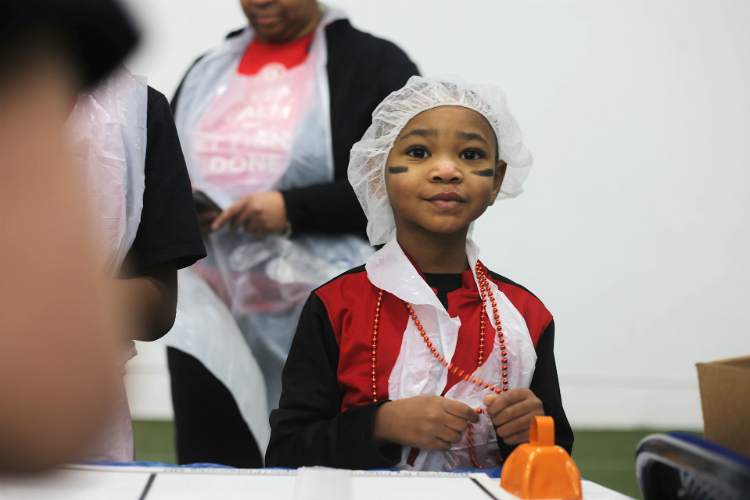 Laylah Johnson, 5, drops dried goods into a funnel to help hungry families at the United Way Food Drive on the Martin Luther King holiday. 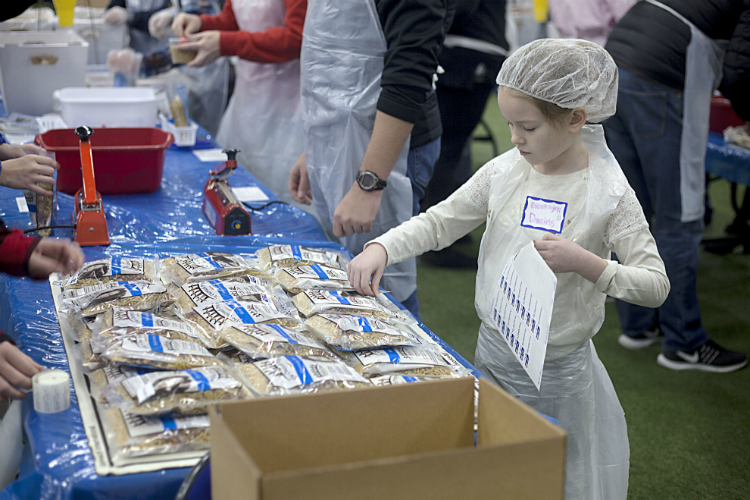 Brooklyn Daniels, 7, works along with her mother Tammi Daniels of Grand Blanc West Middle School to tag meal bags. 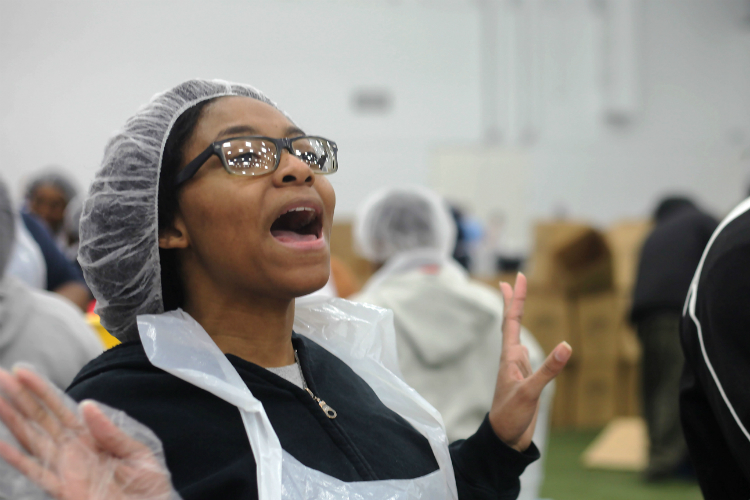 Americorps volunteer Taylor Joyce yells, “BEANS!” for a refill of dried beans that will be added to meals on the United Way Food Drive to celebrate the Martin Luther King holiday. 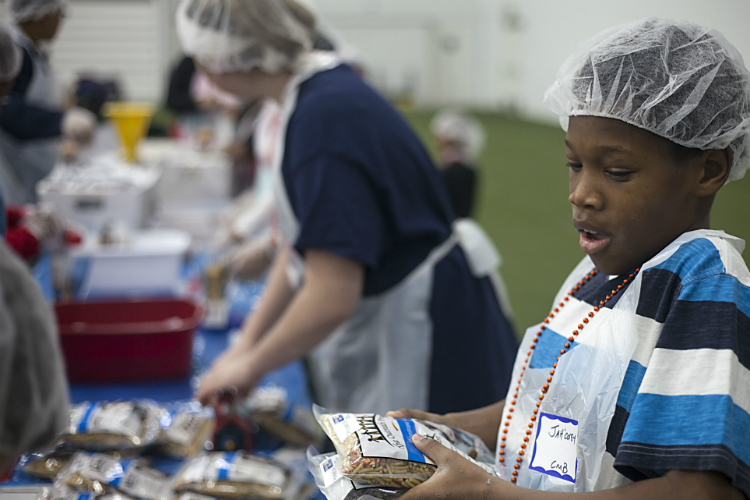 Jah’Corey Baker of the CMB Basketball club packs meals into boxes that will ship all across Genesee County. Maegan Weller, right, of the Valley Area Agency on Aging works with Americorp member Amanda Collins, who says, “It makes you feel good to help actually do something that will have a positive impact on the lives of people who go hungry.” Jody Jackson, 11, and Jaylen Johnson, 14, work together to fill macaroni into bags. 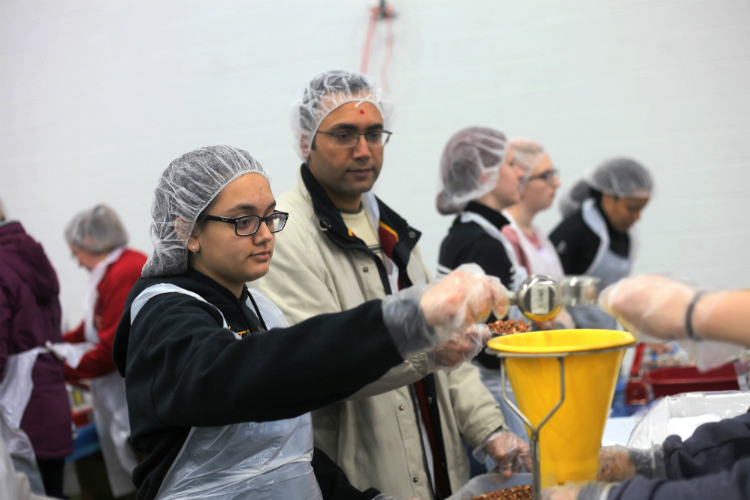 Susmit Patel and his daughter, Salony, 13, pour grains and fill bags of dry goods. They were among a large group of volunteers from Grand Blanc schools. 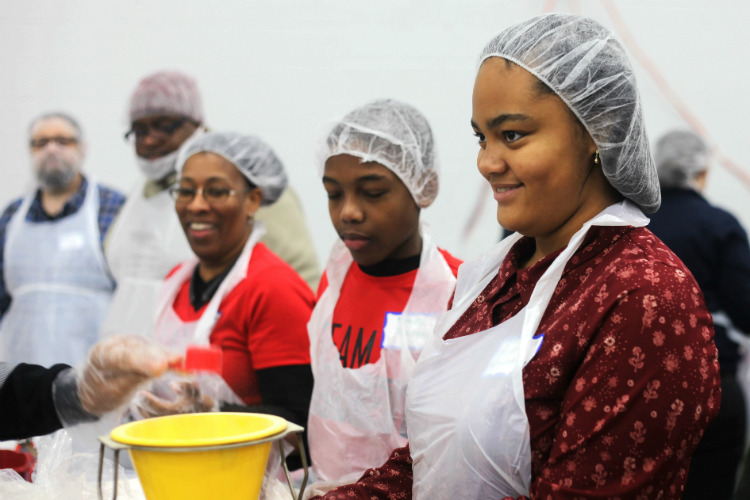 Kaylynn Grandberry, 13, works along with her friends and family to helps back meals. Her father said, “It’s important to get the whole family here ... but even more important is for them to gain a deeper understanding of the issues that are happening Addison Chapa 5, looks at the bags of food her sister Natalie, 7 holds up as they stuff the dry meals into boxes. Natalie Chapa looks over the finished food boxes she assembled along with her mother, Crystal Chapa, and sister, Addison, 5.